Branch chain amino acids, our long friend, bro forum star child, and generally over-hyped supplement of entry-level natty bodybuilders the world over. This supplement has kind of taken a back burner in recent years, what with all the recent hype surrounding beta-alanine and L-citrulline, even HMB and now HMB-FA marketed as Clear Muscle. TL;DR: Stimulant-free BCAA’s make for excellent intra-workouts or even pump-enhancing pre-workouts that won’t disrupt your sleep. Here is a link to our favorite caffeine-free amino blend.. They’re cheap and tasty so there’s not reason not to add it to your stack imho. If people aren’t talking about these then they’re probably going on about the newest whey isolate or super fast absorbing creatine blend. All this time BCAAs have been sitting quietly in the corner, waiting for someone to notice them again. Well, congratulations branch chains, today is the day you make a new friend as we’ve taken the time to get to know you a little more and like what we’ve found. Sure, we knew for example that aminos were super useful when training in a fasted state to help prevent our body from going into a catabolic state. This is why they are often supplemented as an “intra-workout” drink. We also knew that these essential acids are the building blocks of protein itself, so that it didn’t make sense taking them after a workout but before and during were more optimal times. Now that you realize just how useful these humble bastards can be, let’s dig into what brands are making the best supplements available for purchase! What Makes a Good BCAA Supplement Anyways? In case you don’t want to do any more reading and are just looking for the best BCAA supplement then here you have it: our two favorite are Amino Energy by Optimum Nutrition (caffeinated, best for pre-workout) and Xtends by Scivation (no caffeine, best for intra and post workout). It comes in a million delicious flavors from mocha to orange, both great for early morning workouts! Essentially, if you’re looking for a mild pre-workout that doesn’t make you feel like you just snorted a blend line of coke and meth then Amino Energy is perfect. However, this isn’t to say Amino Energy is perfect ALL THE TIME. Because it’s not, because caffeine that’s why! If you drink coffee in the morning and at work, you’re probably already consuming between 3-500MG of caffeine already. Adding another 1-300 (depending on your pre-workout of choice) you end up with extremely and potentially unhealthily high levels of caffeine consumption. Over time this can lead to hypertension and an unbalanced caffeine addiction, which in turn makes you feel strung out, anxious, and unfocused, none of which are good for bodybuilders. That’s pretty much what happened to us. We were putting in 9 hour work days, consuming 2-3 cups of regular coffee, and adding 3-4 scoops of Amino Energy for our workouts in the morning or evenings after work. While this helped us power through our workouts and make gains, we slowly noticed a few negative side effects. First, our eye started twitching. No joke, it would happen probably 5-6 times a day and last for a minute or so. It wasn’t a big deal but became about as annoying as a mosquito in your ear after a while. Second, the quality of our sleep began to diminish. Doing 3-4 cups of coffee plus pre-workouts everyday would help us complete a HELL OF A LOT of work in a given day, but when we got in bed to recover, we just couldn’t fall asleep. The excessive amounts of caffeine consumption over the course of the day had wired our brain to be productive all the time, it just couldn’t shut off. So finally, this led us to face the facts and address our caffeine addiction. We cut our coffee down to 2 cups/day MAX and looked for something to help get us through our grueling 2 hour workouts. This is how we met our old friend BCAA in the form of Mutant 9.7. Going stimulant-free was a tough thing to do. Who doesn’t love that “beast mode” feeling they get after slamming a good strong pre-workout like B-Nox or O.N Gold Pre. Hell, if you’re one of those people that loved the old JACK3D with the DMAA, going stimulant-free will literally be like going to rehab. Don’t get down though, if you’re into bodybuilding you’re used to a pain for gain. Unfortunately for all stimulant lovers, the ubiquitous “beast mode” feeling comes at a price, and that is tolerance and addiction. Don’t get us wrong, we will still continue to use quality pre-workouts, just on a much more sparing basis and on an irregular timetable, keep the body confused and unable to build a tolerance, just like our weight lifting routines! Sometimes you just need that little extra boost to motivate your first couple sets, then once you’re in the zone your central nervous system can take over. Likewise, sometimes when doing hypertrophy work you really want to be able to focus and establish a solid mind-muscle connection, another benefit of caffeine. However, if you’re already at your caffeine max and just want a solid workout, without worrying about going all catabolic, then non-caffeinated BCAAs are just the thing for you. We looked at 3 options of big name amino acid supplement companies. There are many many more, but these are the 3 that our local shop had and since we’re based out of Taipei, Taiwan, sites like Amazon or Bodybuilding.com aren’t really an option. We at Skinny Yoked think it is very important to only write reviews about and recommend products that you’ve personally tried. Without doing so what authority do you have to be recommending anything? Regardless, the 3 major non-stimulant amino brands below are pretty much the dominant three on the market and are all from very reputable manufacturers that all bodybuilders should instantly recognize and trust. This is probably one of the longest standing unofficial “gold standards” within the BCAA category. O.N makes quality stuff and their reputation is almost unbeatable. We like the direct no-frills marketing of BCAA 5000 Powder, it is just what it says it is, a 5000 mg blend of three branched chain amino acids, L-Valine, L-Leucine and L-Isoleucine. Pretty solid stuff, as Luceine is one of the more potent muscle building acids, of which HMB-FA is derived and why Clear Muscle seems to be such a dope supplement. But we get sidetracked. 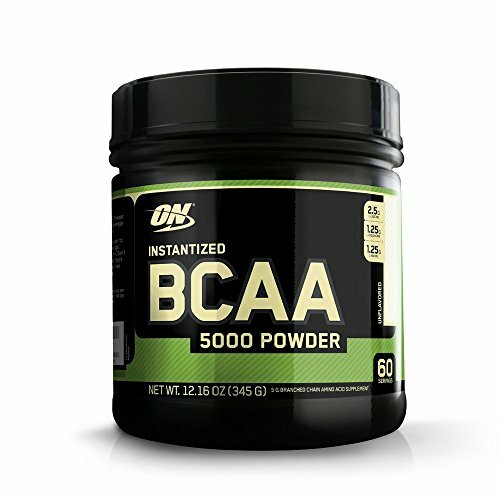 BCAA 5000 by O.N got our attention first because of the direct labelling and simple marketing. Unfortunately, our interest piqued at that. After looking more closely at the ingredients we saw they weren’t kidding with their naming, as there was pretty much nothing else included beyond just the BCAAs themselves. After we thought about it a bit this made sense. 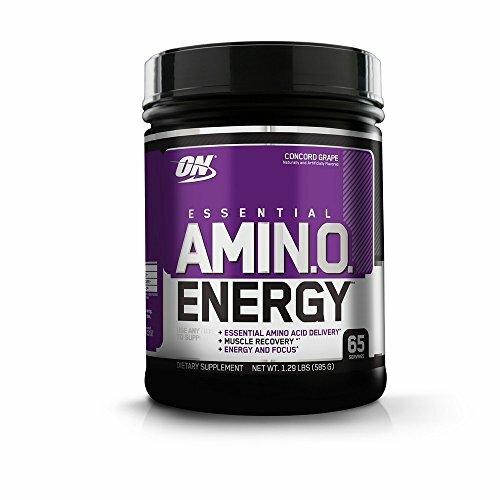 O.N markets their Amino Energy as a pre-intra workout drink. This on the other hand seems to be a “whenever in the day you need BCAA support” product. That is why there are no nitric oxide elements, no electrolytes, no creatine or anything else found in pre-intra type BCAA drinks. This is PURELY a BCAA supplement and nothing else. Fair enough O.N, fair enough. So BCAA 5000 Powder is more of a later-in-the-day or evening amino booster, not specifically a pre-intra workout booster which is what we’re looking for. At around $24 for 40 servings it’s fairly priced, and a good option if all you want is pure aminos. We wanted more however, which led us to our next contender.. 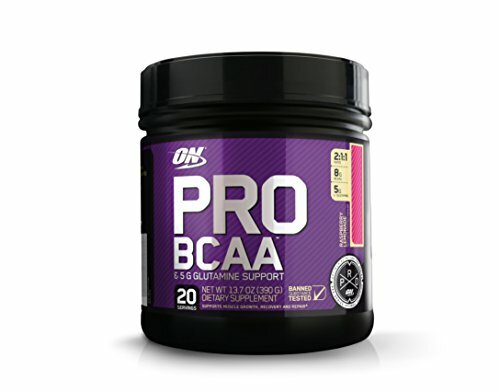 Surprise surprise, the second option we were looking at was PRO BCAA, and is also from O.N. The PRO line is a weird subset of the O.N line, sitting somewhere between their “standard” regular products and their “gold” products. For example, O.N now has three BCAA products in total, the simple BCAA 5000 mentioned above, this PRO BCAA and now a new BCAA Gold Standard. PRO BCAA builds off where BCAA 5000 leaves off. That is to say, instead of JUST BCAAs it also has added Vitamin C (which we LOVE because staying healthy is key to sustaining gains production), Sodium (to replace what you sweat), branch chains of course, L-Glutamine (5g) and a “phytoblend” of grape seed extract, red wine grape extract and citrus bioflavanoids. We’re guessing those are for color and perhaps some N.O effects, antioxidants at the very lest. This sounds good, 8 grams of BCAAs, some extra booster ingredients to keep the body healthy and happy. The only downside to PRO BCAA is it’s price. While BCAA 5000 is reasonable at around $24 for 40 servings, this PRO version is closer to $25 but only has 20 servings per container! That’s the same price as BCAA 5000 but literally HALF the servings.. This kind of bothers us, is the extra l-glutamine and vitamin C really that expensive? Given how common these supplements are, we highly doubt that. You can buy a roll of vitamin c tablets for less than a buck and glutamine is already added to most protein powders which you consume post workout anyways, so why pay double? While PRO BCAA seems a little bit like a rip-off to us, we are excited about the new BCAA Gold Standard. It’s got new additions such as magnesium, bakers yeast beta glucan also known as “Wellmune” and Rhodiola Extract. 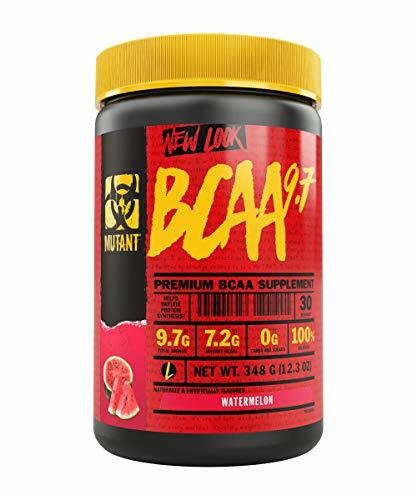 We’ll wait to review that one at a later point, but at almost $30 for 28 servings, it seems to be a bit on the pricey side as well, especially for only offering 5 grams of BCAAs. What makes a “perfect” supplement? Well, if it were a graph, it would be where quality, quantity and price all intersect. While the above mentioned supplements all have their strengths, they all also have glaring weaknesses, most commonly “affordability”. Sure, if you’re spending money on this stuff, it’s all “discretionary spending” anyways, but that’s no reason to not shop for the best deal on the market. It would seem that out of these products compared today that Mutant BCAA 9.7 would win the title as “best deal”. Why is Mutant’s product so dominant? Well let’s look at the label a little more closely. 9.7 GRAMS | This BCAA powder has 9.7 grams of fully instantized BCAA energy blend to help with your recovery which can promote muscle growth over time. 8 ADDED ELECTROLYTES | Staying hydrated is an important part of building muscle! That's why we made sure to add 8 electrolytes to keep you hydrated to keep you going! ABSORPTION ACCELERATOR | This powder is finished off with a patented absorption accelerator to make sure it works as hard as you do. A full 9.7 grams of BCAAs, including 7.2 grams of BCAA’s in a classic 2:1:1 ratio. This is 2.2 grams MORE than O.N’s BCAA 5000 and just under the super expensive PRO BCAA by O.N. Still, we said 9.7 total remember? So in addition to the 7.2 grams of BCAAs this Mutant product ALSO has 2.5 grams of “volumizing aminos”. Pump support! Now that’s what we want to see! This includes Taurine, Glycine, L-Glutamine, L-Arginine and L-Tyrosine. If you compare that to PRO BCAA you’ll see that O.N comes up short, as they only throw in L-Glutamine but lack the volume-enhancing N.O factors that Mutant includes. Mutant 9.7 doesn’t stop there though, they also throw in 120 mg blend of 8 different of electrolytes AND 5mg of Bioperine to better help your body quickly pick up and absorb all these wonderful pump enhancing BCAAs. Neither of the O.N products include this absorption agent. Sprinkle some magnesium (50mg) and sodium (20mg) on top and what you have in Mutant BCAA 9.7 is the PERFECT Intra-workout supplement. What makes this all just fantastic is it also tastes DELICIOUS! We got the watermelon flavor, and were skeptical, because other watermelon flavored pre-workouts can be overly sweet and ultimately pretty disgusting when swallowing them whole between sets. Mutant’s watermelon flavor was very mellow, not overly sweet and had a hint of like, Pepto-Bismol creaminess to it. Like a slightly chalky (in a good way) water melon juice. It was flavored just enough to be pleasant, but not overly flavored to the point where we got sick of it. Oh and we forgot to mention, at just under $24 for a full 30 servings, it’s also the most affordable in this comparison. So it would seem Mutant have hit a home run with their stimulant-free BCAA 9.7 supplement. We love the electrolyte support and pump enhancers, showing they really know when this should be taken, which is during your workout. In conclusion, we have to say there truly seems to be a tool for every task at hand. If you want a energy boosting pre-workout, they have those, they include things like B-Nox Androrush, the classic C4 or O.N Gold Pre-workout. If you want a pre-intra workout that provides BCAA support and energy you can find that in the delicious Amino Energy by O.N, still, if you want solid intra-workout support without the caffeine there are plenty of options, best of them, Mutant 9.7.